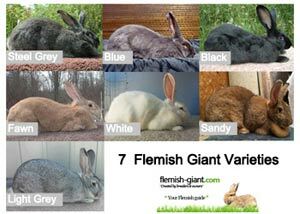 The one thing that distinguishes a Flemish Giant from other breeds is size. In order for him/her to reach his full potential & having healthy teeth, he must be provided with a never-ending supply of fresh, clean water & fed a high-quality diet of hay & pellets on a daily basis. This is an important part of the daily care cycle. While there is much debate among breeders & pet raisers alike in regards brand-names of feed and of the exact amounts of nutrients, they all agree that certain things must be present. Another notable factor is that in general, rabbits do not over-eat. They eat when they are hungry, not because they are bored – as do humans. The difference between giant & smaller breeds however is that no harm is done in ‘free-feeding’ the giants, as long as the feed is healthy; but treats such as veggies & fruit should be limited. In addition, just as the case is with people & most other animals, not all rabbits will eat the same things. Tastes will vary, & when that’s the case, allowances must be made. For the purposes of this site, we are giving general acknowledgement in regards to nutrient percentages based upon many years of personal experience. However, please note, this is not an absolute science. 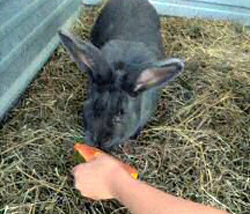 Essentially, Flemish Giants require a high-quality pellet feed. Please note that not all pellets are of high-quality. How do you know the difference? The best method is via sight & smell, as well as trial-by-error. A high quality pellet will have a nice ‘fresh’ smell to it, & will be a green to brownish coloration, be completely or at least primarily dust-free, & without exception it must be clump-free. If at any time a bag is found to include moldy, grey-ish, or otherwise discolored or clumps of pellets, immediately discontinue feeding it; throw it away or send it back to where it came from. 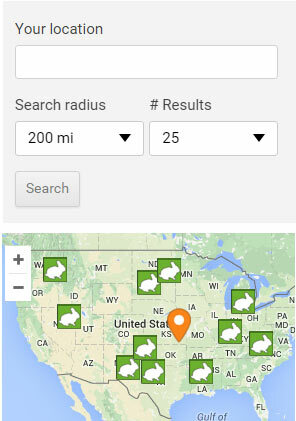 The problems that could arise from using such feeds can quickly & easily become devastating! 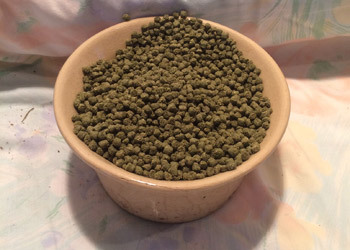 Otherwise, high quality pellets are most commonly sold in 25 – 50 pound bags; not in “pretty bags” or with “pretty colors” of pellets mixed into the green/brown ones. Pretty colored nuggets are simply more of a sales-gimmick, to get unknowing pet owners to buy their product. Respectfully, I will mention here that the colorful pellets don’t hurt your rabbit(s), but they aren’t helping either; in other words, “its just eye candy.” When you get down to the business-end of that however, those colorful tidbits are basically taking up space in a limited sized bag for the more-needed, more nutritious regular pellets. With that said, what you need to do is read the ingredients’ tag on the bag. Flemish tend to thrive with higher amounts of protein & fiber. Ideally, you want no less than a 15% Protein content, but a 16 – 18% basis will yield better results. When it comes to fiber, this can be a toss up that is mainly dependent on other supplements, such as type & amount of hay given. If you give your giants a high-end quality & good amount of Hay regularly, then a lower fiber-to-pellet basis is fine. However, if you are using a type of hay that is lower in fiber, then you would want a higher fiber-to-pellet basis. Other bonus ingredients would include papaya, yucca, & dried yeast. Not only are these products nutritious, but they also are highly preferred palate-wise. Notably, the better it smells & tastes, the better it will be eaten. The same is true to that opposition too. No matter how nutritious the pellet is, if your bunny does not like it, he will not eat it. If he does not eat it, it will do him no good to have it. We suggest that you also visit our FAQ section which includes a lot of tips and answers the most common Flemish Giant questions. Moreover, this section covers multiple food related questions. Hay – What’s the difference? Alfalfa is usually brittle with flat green to brown leaves but can vary from dark lime green to yellow/green/brown depending on the season. It is high in calcium, but it can cause bladder-sludge & is high in calories. If you feed Alfalfa, watch out for loose or wet droppings, excessive weight gain, thick/dark urine and cecal pellets not being eaten. 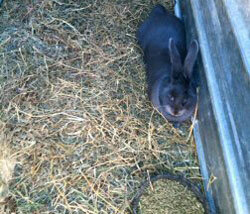 These are usually problems of the rabbits that are +2 years of age. 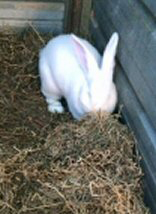 Timothy Hay is the most-recommended hay for rabbits. It looks like a dried blade of grass, fairly wide and its color is a soft green to grey/brown green. Timothy hay also has “solid cattails” which distinguishes it from Orchard grass hay. 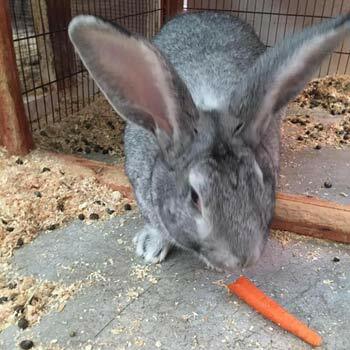 The fiber and calcium content is closer to ideal for the needs of rabbits, and doesn’t come with the risks involved when feeding Alfalfa, yet offers more than Orchard Grass varieties of hay. They love to eat hay! Orchard Grass is lower in nutrient content, though very similar in appearance to Timothy but the “cattails” have small pieces missing from the cattails, and they are usually pale brown, whereas Timothy is soft green to light yellow or brownish.